RIT engineering students worked with staff at the Metropolitan Museum of Art to install a portable camera rig they designed and built this past year. They worked with Susan Farnand from RIT’s Chester F. Carlson Center for Imaging Science and Barbara Bridgers, general manager for imaging at the museum, on design specifications for the custom rig. It became much more than a senior design project when the engineering students set foot in the Metropolitan Museum of Art in New York City. In October, when on an initial trip to collect information for the project, most had never been to the museum, let alone New York before. On Thursday, May 15, after several months of work, their custom-made camera rig became a part of the museum’s operations and imaging efforts. 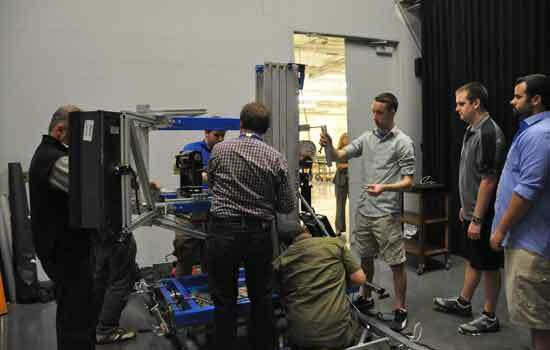 Seven students from the Kate Gleason College of Engineering delivered and installed a Vertical X-Y Camera Rig they designed and built for the Metropolitan Museum of Art. They had worked over the past academic year with Susan Farnand, assistant researcher in the Chester F. Carlson Center for Imaging Science, to upgrade a stationary, ceiling-mounted camera rig in the museum’s imaging studio used to take high-resolution images of artwork. But the museum also had other works of art that needed to be imaged, and having a mobile unit to photograph these larger, permanent installations was necessary. Farnand originally worked with Barbara Bridgers, general manager for imaging at the museum, on previous color reproduction projects. Being both an engineer and imaging researcher, Farnand was familiar with the imaging needed at the museum as well as the capabilities of the engineering college, particularly its multidisciplinary senior design program, where students are required to complete design projects over an academic year using engineering and product design methodologies. She proposed the Metropolitan Museum project, and the students started work this past fall. Thursday, they saw their work onsite and ready to be used. The students had traveled for the first time to New York City in October to meet with the museum representatives and developed the design requirements for the portable imaging equipment rig. Working closely with the museum staff, particularly Bridgers and Scott Geffert ’84 (photographic illustration), the senior imaging systems manager, they designed a custom camera rig. “The students met with the museum’s engineering staff on Thursday morning to review the construction, operation and safety features of the rig. Other departments have collaborative relationships with students in colleges and universities,” said Bridgers. “This, however, is the first time the Photographic Studio collaborated with a group of students to solve an imaging issue. The museum is known for its extensive collections of artwork, including tapestries and textiles from around the world. Having the portable imaging rig allows the group to take photographs in the galleries, and decreases the need to move delicate materials. The overall system was designed around a winch-driven material lift, said Sam Brown, a fifth-year mechanical engineering student. It can be raised 22 feet, a few feet beyond the required 18 feet the museum requested. It also includes a customizable rail system that the main structure will move along, extending up to 29 feet. The mechanical systems—the horizontal and vertical traverse structures, the rails and camera mounts— as well as the electrical systems consisting of several motors and Arduino microprocessors—were all built and assembled at RIT. “We lived in the machine shop,” said Zack Sostack, a fifth-year mechanical engineering student. The system is capable of doing precise position measurements that include the pan and tilt function for the camera base, and it can run automatically or manually. “This rig allows them to wheel it to the artwork, to hoist up the lighting, for the rig to go up and down, back and forth across the artwork,” Brown explained. Structural mounts will be able to hold more than 200 pounds of equipment and rigging on a base that weighs more than 300 pounds. The camera rig will be tested throughout the summer by the studio and engineering staff at the museum. Bridgers expects the camera rig to be used to photograph one of the museum’s exhibits of eighteenth-century rooms from English homes called the Croome Court tapestry room. It was part of a country estate in Worchestershire, England designed by Scottish architect Robert Adam (1728-1792). It featured elaborate tapestries on the walls that extend from floor to ceiling. Between designing and building the rig, displaying it at the recent Imagine RIT: Innovation and Creativity Festival, preparing for their formal senior design presentation about the project and disassembling the rig to get it to New York, the team members had little time to reflect on the experience. The team members are: Brandon Strangman (industrial and systems engineering, Shortsville, N.Y.), Samuel Brown (mechanical wngineering, Dryden, N.Y.), Zachary Sostack (mechanical engineering, Cooperstown, N.Y.), Kyle Bradstreet (mechanical engineering, Webster, N.Y.), Daniel Kearney (electrical engineering, Baldwinsville, N.Y.), Daniel Jang (electrical engineering, Queens, N.Y.) and Matthew Misiaszek (mechanical engineering, Stockbridge, N.Y.). A video of the camera rig is available, produced by Matthew Misiaszek.